The Center has a wonderfully-equipped, 12-computer classroom that offers hands-on instruction for adults in the South King and North Pierce counties. You can learn the basic skills of using a computer, master the ins and outs of the Internet, edit digital photos, learn your way around Windows, Word or Excel, and brave the brand new world of Facebook. 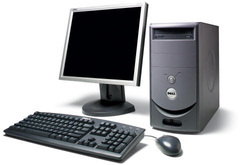 Please note that we use PCs (Personal Computers, such as Dell, IBM, HP, Gateway), and not Apple/Macs. Contact our us, at 253.838.3604 or srctr.tutors@gmail.com.tutors@gmail.com if you are interested in taking a class or have any questions. Drop In Program: Do you have general questions about computers? Having problems with the internet or your email? Would you like a little assistance with Microsoft Word or Excel? Did you know our computer lab is available for drop-in use? We have a wonderful computer lab with eight computers ready to go with several operating systems (Windows 7 or Windows 8.1), and Microsoft Office available on them all. Drop by when we have a computer tutor available and get your questions answered! On Tuesday and Thursday from 1:00 - 3:00 pm we will have one-on-one instruction available. Bring your tablet, your smart phone or your tablet and get the help you need! Note: drop-ins are welcome, but since this is one-on-one instruction, it would be best to make and appointment. Cost: a minimum $5 donation is requested.